Triumph Herald car 948cc 1959. Triumph's Herald, launched in 1959. 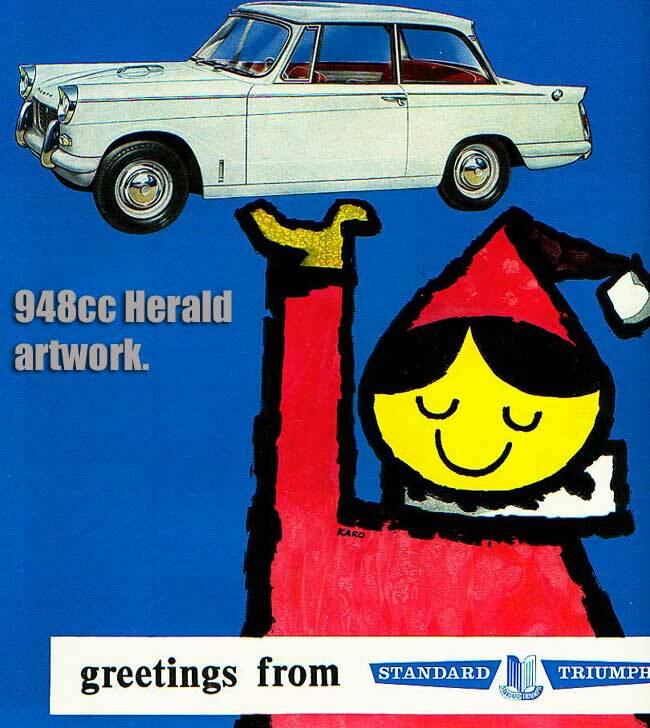 Les sent over this piece of artwork, that probably ended up being used to advertise the then-new 948cc Triumph Herald, which first hit the showrooms in 1959. The earliest Heralds were fitted with the 4 cylinder engine, first seen in the early 1950s Standard 8 (then just 803cc) and enlarged to 948cc for the Standard 10 model. The car illustrated in this advertisement is a very early example, quickly identifiable by the hefty chrome handle that was bolted to the centre of the main bonnet panel. With both side clips unlatched, it was a simple task to hinge the entire front end bodywork forward, revealing not just the engine but also the steering and front suspension components. Heralds continued in production 'til the beginning of the 1970s. The 948 was uprated to 1147cc for the Herald 1200 model, which retained the stylish chrome headlamp surrounds and overall styling of the first Heralds. The 12/50 was very similar, but featured a full length, Webasto-type, sunroof within its bolt-on roof structure. The final Heralds benefited from yet another stretch of the existing engine, taken upto 1296cc for the 13/60 Herald and in line with changes to the Spitfire's powerplant. The bonnet was also re-styled, to bring it closer in appearance to that fitted to the Vitesse, itself based on the Herald but with the 1600cc or 2000cc 6 cylinder engine. The separate chassis of the Herald allowed Standard-Triumph to be very flexible with their range of small cars - 2 door saloon cars were sold in the UK (4 door Heralds were built locally in India), but available for extra money were the coupe (based on early 1147cc cars only), the convertible, the Courier van, and the estate car. The basic Herald chassis also went on to be used (albeit in adapted form) under all Spitfires, GT6s, and Vitesses, not forgetting the curious looking Bond Equipes. Period photographs of the early Heralds may be found on this page of the vintage gallery.